Be the smart one in the crowd. Process Work Opportunity Tax Credits with MaxServices Group. Sign up for the webinar on the American Staffing Association website today! Since 1996, the US government has used programs that incentivize businesses to hire people who are from targeted groups. One of the smartest ways to capture these credits is to start a WOTC program. Under the current Work Opportunity Tax Credit program, administered by the Department of Labor credits granted can be up to $9,600 for certain categories of workers. 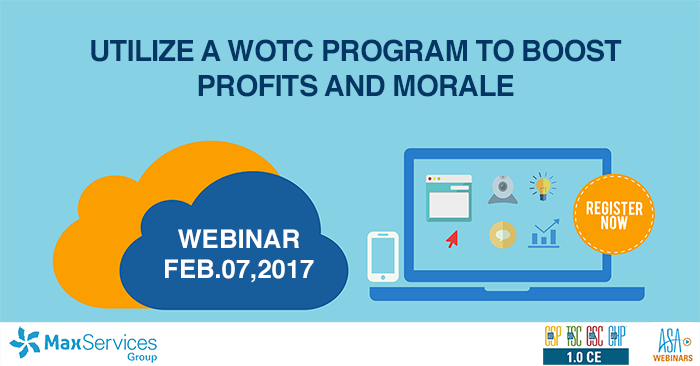 This webinar will give you the numbers to make the WOTC case, and some suggestions on for talking about how socially responsible hiring can help grow your business and your brand. The webinar will be on a TUESDAY, February 7th at 3 PM ET. This webinar qualifies for 1.0 continuing education hour towards maintaining your ASA credential. MaxServices Group helps our clients achieve maximum results through innovative workforce solutions that establish more profitable and successful business operations, including Affordable Care Act Tracking and Compliance, E-Onboarding, Staffing Software, Tax Credit Processing and Unemployment Cost Management.